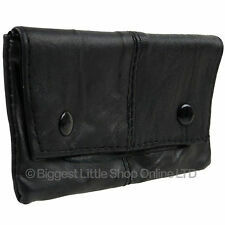 Leather cigarette case with USB rechargeable lighter electronic Black UK.. 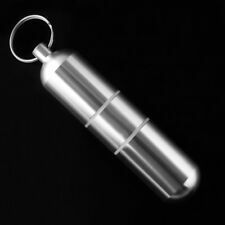 Perfect travel gadget. Lights a cigarette in any weather. Might be real leather! A few scuffs to this (see photos), but that just adds to character! Material Aluminium Alloy. Texture Of Material Aluminium Alloy. Model Number cigarette case. 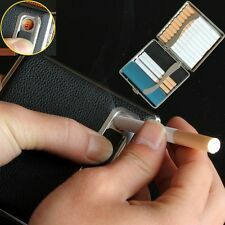 Suitable for loading index: 4pcs cigarette. Whether or not waterproof waterproof. Features: convenient, waterproof, delicate, beautiful. Inside the elastic is still in very good condition, and the case is in good shape. In well used condition with plenty of wear left. Plain silver cigarette case which holds 7 cigarettes. Supplied in black card box so is easy to wrap and give as a gift. This item can be engraved. to discuss any queries or issues you may have. Showing signs of heavy use edges of the leather on the outside are well worn and top left side of the interior leather is split ( showing the soft wool padding). Interesting item as I’ve never seen one like this before. 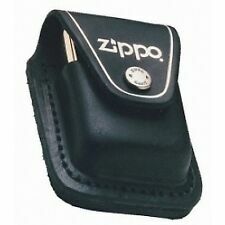 Contains two arms to keep your cigarettes in place and is perfect for any handbag or coat pocket. County Engraving Engraved Gifts and Awards. Personalised Cigarette Case. Engraving on the back approx 8 Lines of 17 characters per line, including spaces. Personalised Cigarette Case. 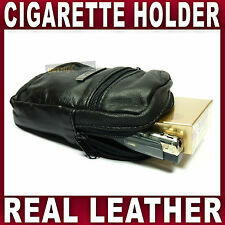 Contains two arms to keep your cigarettes in place and is perfect for any handbag or coat pocket. County Engraving Engraved Gifts and Awards. Engraving approx 8 Lines of 17 characters per line, including spaces. A black leather covering together with a gilt interior completes the look. - Band is present inside. This would make an excellent gift! - Photos are of the actual item for sale. Personalised Cigarette Case. County Engraving Engraved Gifts and Awards. Engraving approx 8 Lines of 15 characters per line, including spaces. Engraved Products;. Non Engraved Products;. Ending Soon. 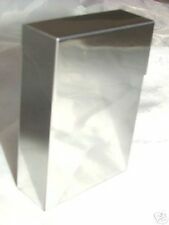 Silver plain polished double cigarette case which holds 20 king size cigarettes. This item can be engraved. to discuss any queries or issues you may have. Made circa 1960 by Tremblay of Paris,France. It would make a great card case. 9 x 6 x 2.5cm. Classic Brocante is a husband and wife team, Franc and Karen Jackson. 13 x 9 mm weighing 200grams this heavyweight cigarette case inscribed 1933 T W Gribble inside and. No repair work has been done on this lovely item. Superb Quality Art Deco (1920s) Collector’s 4”/10cm Gents English Chromium Plated Stainless Steel Slim Cigarette Case With 24ct Gold Plated Interior. If you have one that is older, its a real find – hang on to it!